The world of dentistry has undergone major changes and lots of evolution over the past few years. Advanced in dental technology and techniques has given many patients better-looking teeth that also function extremely well. One of the main advances that have taken place in recent years is the introduction of composite resin fillings that match your teeth’s color. However, these fillings weren’t always used. You may know someone who has silver fillings, and you might be one of those people yourself! Silver fillings, also known as dental amalgams, used to be the standard way to fill cavities. Now that there’s a better way to fill cavities, dentists and patients alike are examining the safety of silver fillings, which are still used today. First, let’s take a look at exactly what silver fillings are. Dental amalgams are made up of a variety of different metals, including silver, tin, copper, and mercury. That’s right, silver fillings contain mercury, which is one of the reasons its safety is being called into question. Silver fillings have been used to fill cavities for over 150 years, and millions of patients today still have their old silver fillings. They were first invented in 1819 and swarmed the dental world by force. Many dentists preferred to use these fillings because they were cheaper and easier to use than the previously-used gold fillings. Shortly after silver fillings came to the United States, dentists and patients started to notice adverse health problems. This was before people knew that mercury could poison you. After that point, numerous studies were performed and anti-amalgam organizations were created. For the past 150 years, people have fought about the safety of dental amalgam and how it affects the human body and oral health. Since silver fillings contain mercury, there are many people who think that it will cause health problems in patients who get them. However, many of the main dental organizations maintain that amalgams are perfectly harmless, including the American Dental Association (ADA) and the Food and Drug Administration (FDA). This reasoning is backed up by extensive studies and research. These organizations often advocate for the use of amalgam since it’s inexpensive and practical. However, there are also many toxicity experts who disagree, citing concerns over mercury poisoning and other complications. Ultimately, the decision to get silver fillings is left up to you, depending on whether your dentist even uses amalgam on their patients. Weigh the pros and cons of getting silver fillings before you make a decision. Consult with your dentist and voice all your concerns. Your dentist should always be able to give you a good recommendation based on the specific condition of your oral health. If you already have silver fillings, you may want to get them replaced, especially if you have concerns over their safety. If you want to replace your silver fillings, call your dentist and get an appointment set up right away. 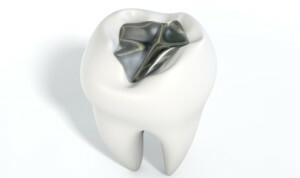 Over time amalgam can degrade and open your teeth up to getting more cavities.